Hawaii, D.L. 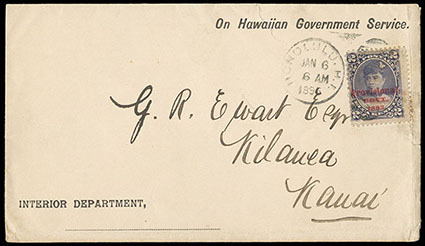 Meyer, Dealer in Hawaiian Postage Stamps, Wailuku, Maui, H.I., stylized corner card on cover bearing 2¢ brown (75) tied by purple "Wailuku, Maui, Oct 15, 1895" cds to Honolulu H.I., Oct. 18th arrival backstamp, F.-V.F. and scarce corner card. Peters-Uota No. DLM-CC-1 Estimate $200 - 300. 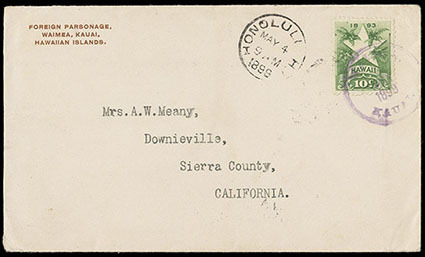 Hawaii, Foreign Parsonage, Waimea, Kauai, Hawaiian Islands, brown printed corner card on cover bearing 10¢ yellow green (77) tied by purple "Waimea, Kauai, 3 May 1899" cds on cover to Downieville Cal., "Honolulu, H.I. May 4, 1899" transit duplex, reverse with Tacoma (5.20) transit and indistinct arrival cds, Very Fine and choice. Peters-Uota No. FP-CC-1B Estimate $200 - 300. Hawaii, Geo. 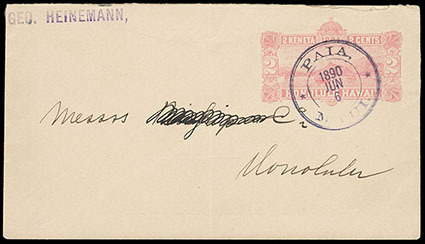 Heinemann, purple straightline corner card handstamp on 2¢ rose (U2) entire cancelled by black "Paia, Maui, 1890 Jun 6" double-circle datestamp to Honolulu, Jun. 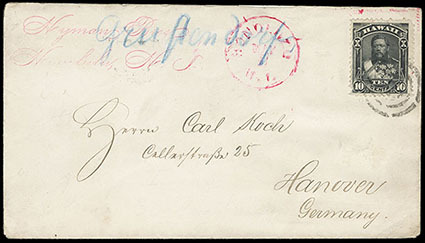 7th arrival backstamp; addressee's name crossed out, otherwise Very Fine and scarce corner card handstamp. Peters-Uota No. GH-HS-1 Estimate $200 - 300. 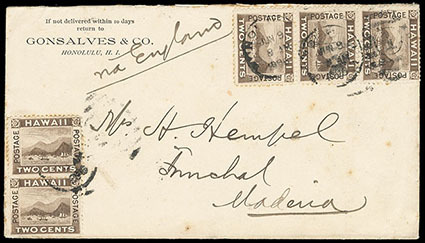 Hawaii, Goncalves & Co., Honolulu, H.I., printed corner card on cover bearing 2¢ brown (75), strip of three and two singles, all tied by partial "Honolulu, H.I., Jun 9, 1896" duplex to Funchal, Madeira, endorsed "via England", Madeira (7.6) arrival backstamp; minor tone spots, Very Fine. Peters-Uota No. GC-CC-2 Estimate $150 - 200. Hawaii, n Government Service, group of four envelopes for Interior Department, Department of Attorney-General Bureau of Police at Honolulu, Finance Department, and Judiciary Department (reverse with "Coll. 10.10 A. M." straightline); mixed condition with faults, F.-V.F. 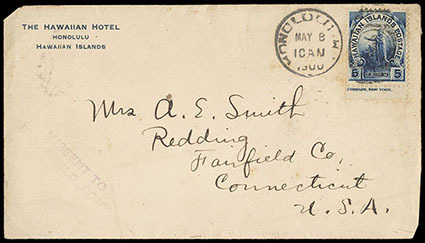 Hawaii, The Hawaiian Hotel, Honolulu, Hawaiian Islands, blue printed corner card on cover bearing 5¢ blue (82) tied by "Honolulu. H.I. 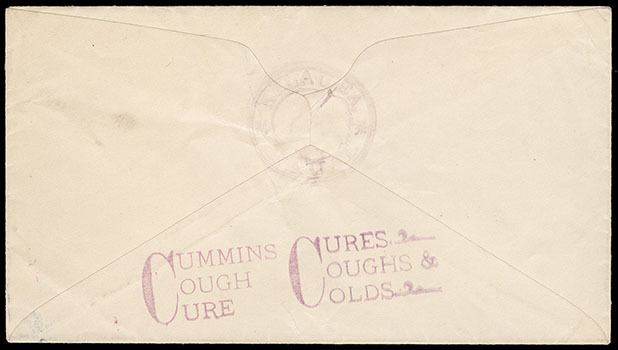 May 8, 1900" duplex to Redding Ct., reverse with Honolulu purple "Collection 9:25 A.M." straightline handstamp, clipped corners for bubonic plague fumigation, purple "Missent to Ridgefield Conn." two-line handstamp, Very Fine and scarce use. Peters-Uota No. HIH-CC-unlisted Estimate $200 - 300. 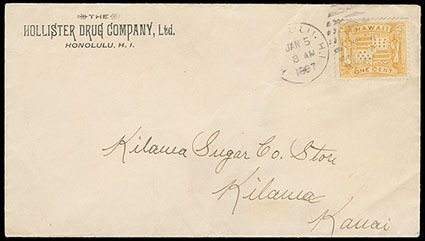 Hawaii, Hollister Drug Company, Ltd., Honolulu, H.I., corner card on pristine cover bearing 1¢ yellow (74) tied by "Honolulu, H.I., Jan 5, 1897" duplex to Kilauea, Kauai, reverse with additional purple "Cummins Cough Cure / Cures Coughs Cold" (HOLD-HS-1) two-line handstamp and violet Kilauea arrival backstamp (M-H 282.011), Very Fine. Peters-Uota No. HOLD-CC-1 Estimate $200 - 300. 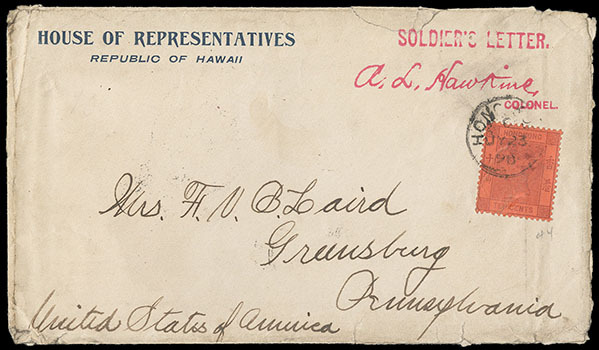 Hawaii, House of Representatives, Republic of Hawaii, blue corner card cover with red "Soldier's Letter, Colonel A.L. Hawkins" handstamp endorsement, addressed to Greensburg, Pa. franked with "Hong Kong 10¢ definitive" tied by "Hong Kong, Jy 23, 98" cds, appropriate transit and receiving backstamps; cover edge wear and tears, F.-V.F., a very interesting Spanish American War usage. 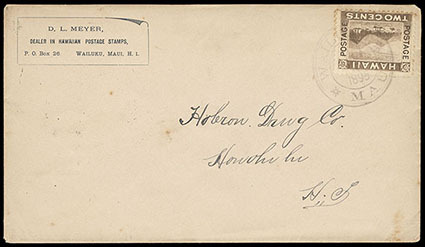 Hawaii, Hyman Bros, Honolulu H.I., two-line script corner card handstamp on cover bearing 10¢ black (40) tied by segmented ring cancel, red "Honolulu H.I., May" cds to Hannover, Germany, reverse with New York transit cds and German (5.30) arrival cds, F.-V.F. and scarce use of corner card handstamp on face. Peters-Uota No. HB-HS-3 Estimate $200 - 300. Hawaii, J.F.C. 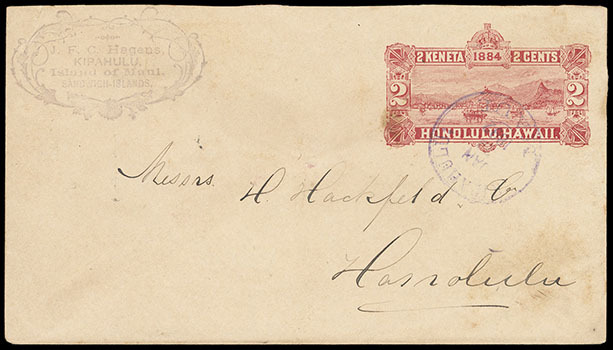 Hagens, Kipahulu, Island of Maui, purple ornamental corner card handstamp on 2¢ carmine (U2) entire cancelled by purple "Kipahulu, Maui, Jan 29, 1892" cds (253.51, R5) to Messrs. Hackfeld at Honolulu, reverse with Honolulu (1.31) arrival cds, Very Fine, ex-Peters. Peters-Uota No. JFCH-HS-1 Estimate $500 - 750.